I recently consulted a calendar and discovered some troubling news: July is over. Isn’t that crazy? It is for me. It seems like just yesterday that I was with my girlfriend watching the fireworks, and as we stared up at the night sky, holding hands, awestruck by the display, I leaned over and whispered in her ear: The second this ends, we have to run to the car so we can beat the traffic. July 1 – Toyota announces it’s sold 10 million units of the midsize Camry sedan in the United States. After a brief phone call from Enterprise, Toyota announces it’s sold 10.1 million units of the midsize Camry sedan in the United States. July 2 – BMW says it will reveal the production-ready i3 in 27 days. This announcement is met with intense enthusiasm among online commenters, largely because it means they no longer have to endure further spy shots of it. July 5– Mazda will offer a new fuel-saving feature dubbed “i-Eloop,” which is revealed with a straight face despite being named like a fuzzy daytime cartoon character. July 5 – The final BMW M3 coupe rolls off the assembly line, prompting E46 M3 owners everywhere to post on BMW forums about how their car is now a collector’s item. July 6 – Hyundai, BMW and Ford win “Concept Vehicle of the Year” awards, presumably handed out to the automaker who best combines an eye-catching design with an absolute disregard for all federal motor vehicle requirements. July 8 – The new BMW 4-Series configurator launches the same day as the new Lexus IS configurator, giving recent law school graduates two exciting new ways to spend billable hours. July 8 – Chevrolet announces its new Corvette will get 30 miles per gallon, provided you turn off the air conditioning, select Eco mode, lay off the gas pedal, and take the measurement in a Cruze. 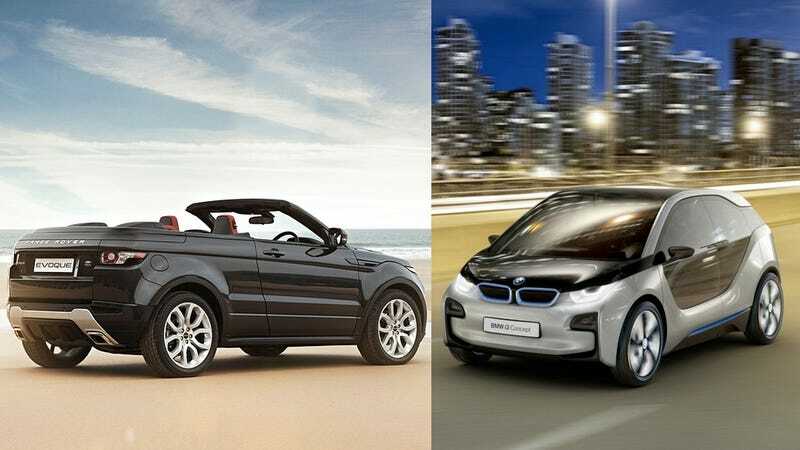 July 8 – Reports surface that the BMW i3 will start around $35,000. Automotive websites deliver this news by showing the same spy shots we’ve all seen, by now, 600 different times. July 10 – Volkswagen announces it’s ditching the five-cylinder engine from the 2014 Jetta, causing riotous excitement from automotive journalists and enthusiasts, and utter indifference from people who actually drive Jettas. July 11 – BMW says it believes China will pass the US as the brand’s largest market in 2013. This is probably due to a long-wheelbase version of the i3, which will be slowly revealed over nine long months of spy shots that depict the vehicle with slightly less camouflage each time. July 12 – Sergio Marchionne claims he might move Alfa Romeo production out of Italy. This threat goes largely unnoticed in Italy because it came during the government-mandated, two-hour early afternoon work break, taken each day between lunch and the government-mandated, four-hour early evening work break. July 12 – Land Rover says it will soon make a final decision on whether to offer an Evoque convertible. Meanwhile, consumers have already made a final decision, namely that they will not be purchasing it. July 14 – Honda says the Ridgeline will take two years off before returning to production. The automotive community is shocked by this news, largely because none of us had any idea that Honda still made the Ridgeline. July 15 – Toyota makes a SpongeBob SquarePants-themed Highlander, providing a direct connection between SpongeBob, who cannot seem to master the rules of the road, and Highlander owners, who often suffer from the same problem. July 17 – The Ram Promaster configurator goes live, giving recent plumbing school graduates an entirely new way to spend time on a jobsite port-a-potty. July 17 – Nissan announces it’s cancelling the Altima Coupe. Things must be pretty tough when you’re being cancelled by the same brand that green-lighted a soft top convertible version of its midsize crossover. July 19 – Land Rover reportedly decides to go ahead with the Evoque Convertible, correctly noting that if it fails, there’s no such thing as too many service loaners at a Jaguar Land Rover dealership. July 21 – Inspired by the MKZ’s success, Lincoln announces plans to redesign the MKT by placing wheels on an actual humpback whale. July 22 – It’s official: the BMW i3 will start around $42,000 including destination. The spy shots are posted yet again, angering online auto enthusiasts so much that they briefly close their browsers and do some work. July 23 – Lincoln announces it will soon replace several important upper-level managers with humpback whales. July 23 – Bentley confirms it will build an SUV, if only to steal away the “driving home from the hospital” photo op from Land Rover when it comes time for Royal Baby Number Two. July 23 – Rumors swirl that Cadillac is considering making a change to its logo, which is the official automaker next step when you have no idea where to go from here. July 24 – Chrysler announces it’s prolonging production of its Dodge Avenger sedan and Dodge Grand Caravan minivan, reminding car enthusiasts that "you may not care now, but you’ll thank us when the airport Enterprise runs out of compacts." July 27 – The Volkswagen Passat turns 40 today. Eager to get a picture with all Passat generations together, Volkswagen starts calling owners of older models. Unfortunately, it turns out there are only eight people in the United States still driving B3 Passats, and each one is actively pursuing a lawsuit against Volkswagen regarding constant engine fires. July 28 – The BMW X5 configurator goes live, giving recent business school graduates an entirely new way to waste time fantasizing about what to do when their wife’s 3-Series lease runs out. July 29 – BMW finally reveals the official i3. Car enthusiasts everywhere briefly glance at the photos and think: Is that all? July 30 – Jeep announces it’s delaying the Cherokee media launch after “discovering the opportunity to further improve powertrain calibration.” Journalists are curious whether Jeep will discover the opportunity to further improve styling calibration. So July is over, and now we can look forward to August. I know I will, if only because we might be able to string together a few weeks without one single mention of the BMW i3. Instead, we’ll probably be talking about the i8.